Writers, readers, and members of the publishing community, in general, are some of the most open-minded and accepting people I know. Almost of those I have met have been people who stand for equality and a peaceful, accepting, always-bettering-itself world. Compared to all those who do, there are relatively few do not fall into this category. Relatively. 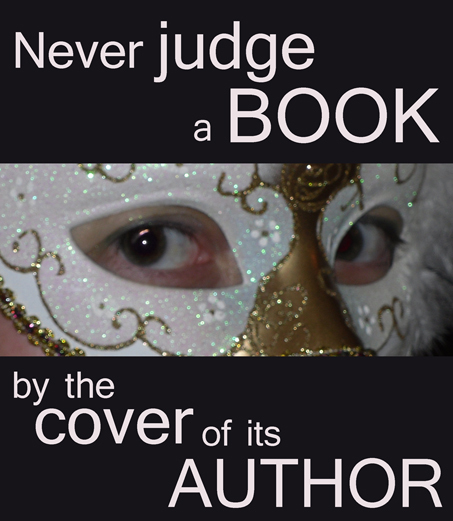 As a child, your parents may have told you the old saying, "Never judge a book by its cover." Good advice. But far sillier, far shallower, is to judge a book by the cover of its author. Nationality, gender, age--none of these are worthy standards of judgement. A book should be judged by its content, not by the exterior of its writer; a writer's ability should be judged by what he or she writes, and not by his or her physical features. Because a book should be valued for what's within, not without. Because, while most people believe this, there are still a few who do not. Who speak loudly and promote hate and inequality. I'd like to remind everyone that, for every unkind person out there, there are thousands who believe in love and equity. To be a thousand voices, a million voices, a billion voices worldwide drowning out the voices of those who hold on to inequality. To remind the world how many people stand for equality, and to ask those who do not to lay down the hatred, and join those who do. We cannot stop those who speak for hate. We cannot change cruel or shallow words. But we can speak back, and we can tell them that we disagree with what they say. I invite you to find a mask, put it on, take a picture, and share it with this phrase. Or hold up a piece of paper with these words, and take a picture of that. I invite you to to use this image if you don't have a mask of your own, or don't want to use your own image. To link here, or re-blog this; to copy it word-for-word or put it in your own words, with credit or without. There are blogs, feeds, twitter accounts for which statements such as this do not fit with the tone or mood or content. If it fits in yours, I invite you to join in. I invite you to post or tweet, to add your mask as a writer or a reader with the hashtag #maskedwriters or whatever else you choose. But most of all, I invite you to simply share your voice, and to say you're one of the majority who believe that it's not okay to promote superficial judgments. That you are among those who believe what is inside a book is far, far more important than the physical features of the writer. That writing ability, not race, not gender, not beauty nor lack thereof, should be how a writer is evaluated.